2 x Vf69 mortar Tobruk's. 1 x FT17 3.7cm KwK 144(f). 1 x S35 4.7cm KwK 173(f). 2 x 4.7cm Pak K36(t). Memorial to the landing of the 2nd Armoured Division (French: 2e Division Blinder, 2e DB), commanded by General Philippe Leclerc landed around the 1st August 1944. Possibly an M4A2 of the 2e Division Blinder. 2e Division Blinder in Paris. A monument to General Leclerc’s 2nd Armoured Division of the Free French Army who landed on this stretch of Utah beach on the 1st August 1945. 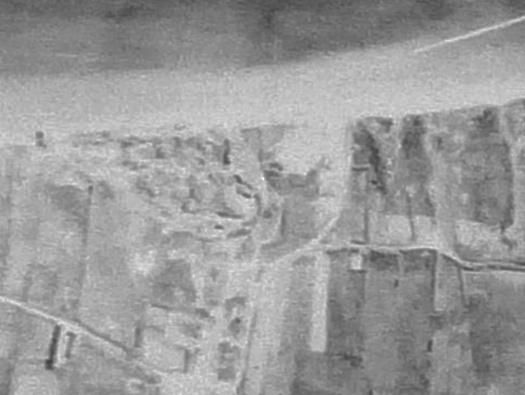 Layout of the defences of StP10 and the barbed wire fence surrounding the inland side. 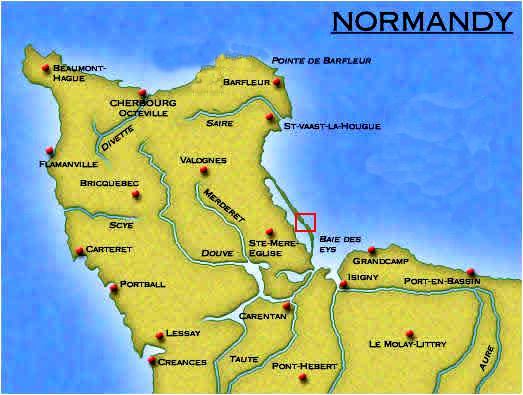 StP10 Hameau Mottet Bigot map. 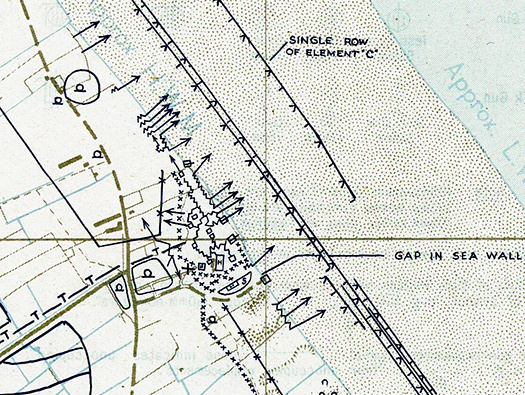 The Allied Bigot map showing the defences and the row of Element 'C' just off the beach.. The RAF & the USAAF had reconnaissance Squadrons that worked together to gather as much intelligence as they could before D-Day. Two 4.7 Skoda fortress guns. The left bunker: an old fortress design not really a field positions type. The right bunker: an R676 an updated version of the Skoda bunker. This one has an integral flanking wall. A better rear entrance and an escape hatch. Oh and much thicker concrete. Left - Vf Skoda 4.7cm Pak K36(t). Right - R676 4.7cm Pak K.36(f). A standard Vf Skoda casemate one of several around this part of France. A Fortress design but adopted here with two flanking walls and also they are quite low so the vision slit can view over them. Gun commander looking through the vision slit. Vf Skoda 4.7cm Pak K36(t). The gun was set into the embrasure and the slit on the left is the gun commanders viewing slot. Two unusual defensive flanking walls may have been added to protect the gun after it was built. They were not standard. Crew of a Skoda gun room with the gun commander looking through the slit. Damage done by the bombardment. The gun was bolted to the embrasure and could swing inward to open. The main 4.7cm gun can be used but also a co-axle MG.Vz37(t) could also be used for close defence. It almost could have been taken here. Note the periscope armoured tub rising out of the bunker. An armoured piercing round. 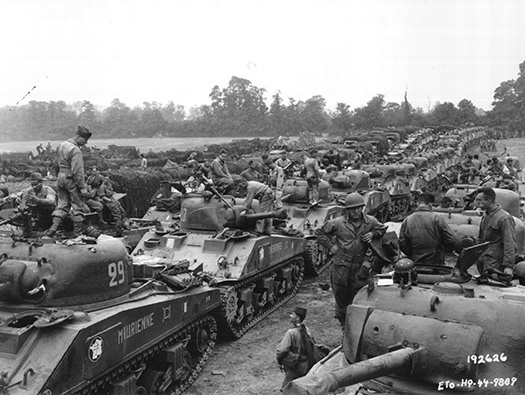 Looks a bit like a Sherman round? or a destroyer out to sea. The escape hatch and steel ladder up the side of the bunker. There would have been a brick wall built around the ladder as protection and the sand covering the whole of the side. The two different styles of covers. The gun fitting and the steel shield that could be drawn up over the gun to protect it. Embrasure steel door can be drawn over the gun. Close up of the embrasure.. The gun room and rear entrance. Periscope tube fitting. This would allow the gun commander to be able to stay in safety and have a 360° view. A very simple gun emplacement with ready ammunition niches around the walls. It would have been a hell of a view from here on D-Day. FT 3.7cm SA Mle1918 (KwK144(f)) on a Tobruk. The base hexagonal ring would bolt onto the Tobruk and the the the turret lowered over it. U shape ringstand for a FT17 MG.311. These very easy to make had a tank turret fitted on the top and small ammunition shelves each side. Crewed by two to three men, gunner, ammunition handler and third either helping pass ammunition or spotting for the gun. 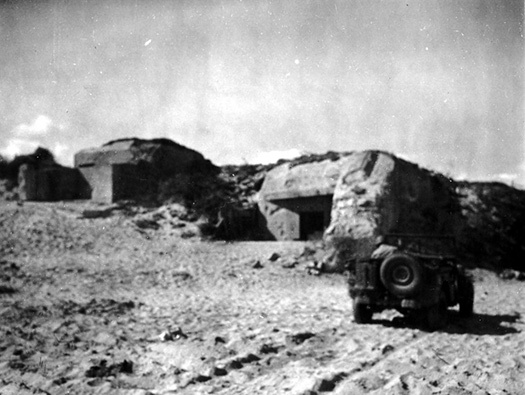 FT17 MG.311 U shaped Tobruk. View into the gun room and the slots for shelving to place spare machine gun ammunition. A niche with shelving slots. R612 casemate for a 7.5cm F.K. R612 casemate for a 7.5cm F.K. LAG gun. Gun room. A heavy steel door frame around the entrance where there should have been two steel doors. These if fitted would have been removed by the scrap men. L.A.G. Landings Abwehr Geschutz ( Landing Defence Gun). 75mmfk235b the type of gun that may have been here. Gun room. The half round slots in the floor were so the guns trail could slot into it and stop the gun moving backwards when fired. The view the gunners would have had up the beach to the north. The gun room towards the rear. The two large pipe fittings on the left side for a large extractor fan. Plan of the extraction in an R669 casemate. Two ammunition niches either side. How the niche may have been laid out. The view at the front. Note the small machine gun embrasure to the right of the bunker. R612 casemate small machine gun embrasure. Tagged onto the side of the casemate is a machine gun position. Machine gun firing through an embrasure like the one hear. 483P2 of the type that may have been used here. 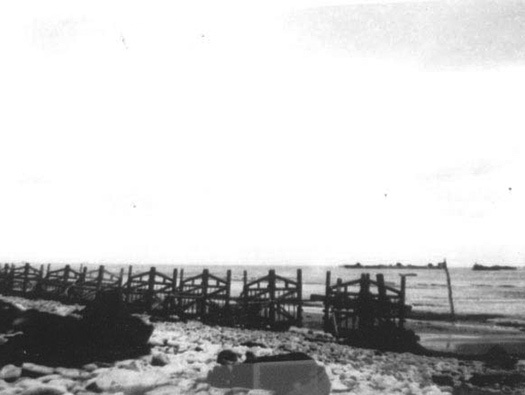 The Belgian Gates removed off the beach by US engineers. Belgian Gates marked on the Bigot map as Element 'C'..
An emplacement for a Gr.W.34 80mm mortar. You can just see the second larger mortar pit and the Tobruk for close defence and spotting the mortars fire. 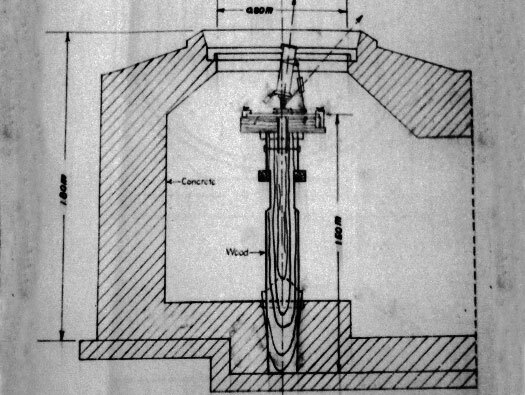 Elevation of a mortar emplacement for an 80mm mortar Bf.69. A box of 80mm mortar bombs. Box of cordite powder bags. This is a very interesting item, its a compass platform where the soldiers stationed here could be shown the points of the compass. A very important training aid. 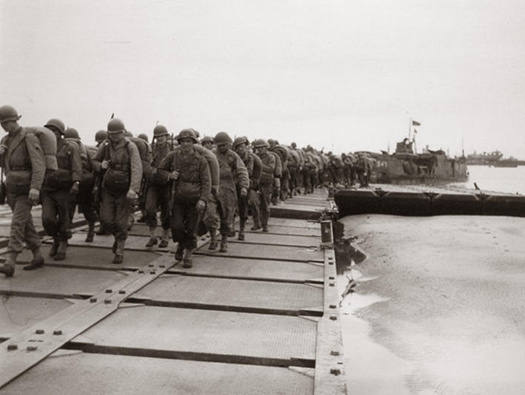 A lot of the soldiers were non German speakers or their fist language was not German, so by taking them here and showing them the points, when told to fire east Exxon degrees, they would know in which direction to fire. Troops on a map reading exercise. The German compass as I said earlier is 0 to 6400 thousands (mills). [Bunkersite.com] and here it can be shown to the new soldiers to the Wn. 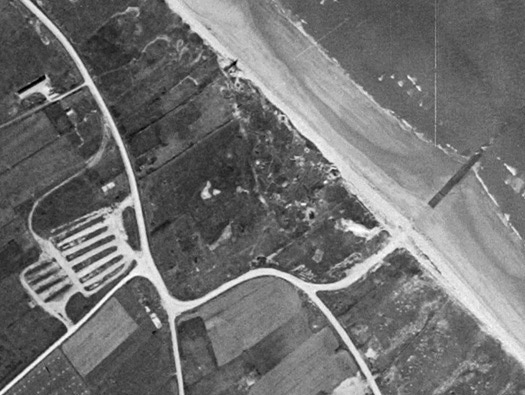 This emplacement would and was sunk into the sand dunes, but for some reason the farmer cleared away the sand and has exposed several bunkers. He has done it rather badly and not in an Archaeological way and left rather a lot of damage and more than the combined forces of America could inflict on it. 80mm mortar bombs in their carrying box. Machine gun Tobruk which doubles as the fire control and observation. From this Tobruk you cannot see the targets to the eastward (sea). So the machine gunner would take messages from a forward observation soldier by a field telephone. But this may brake so he may have to make hand signals to the machine gunner and there may have been special hand signals. Mortar pit ammunition niche. Below the niche is the direction 'S' south. South to West. 31 to 16. The plate for the base of the mortar. Not sure if the damage was during the war or the farmers heavy handed archaeology. Plan of the chimney arrangement. How it may look inside. Vf shelter with two rooms. Plan of the kitchen bunker. The eagle on the other side now chiselled off. Escape in the far wall. It looks like the garage has been made out of an old building. The left wall made of brick and the rest concrete. It may have been a garage for 3.4cm anti/tank gun before the casemates were built. 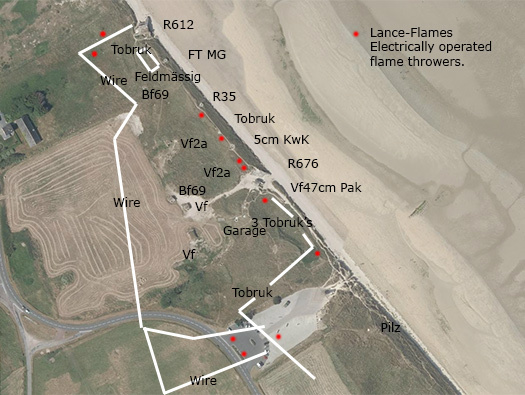 Plan of how these 5cm mortar Tobruk's work. A post set into the centre hole in the floor, pegged tight and the mortar sits on a table on the top. 5cm ammunition box and several bombs. 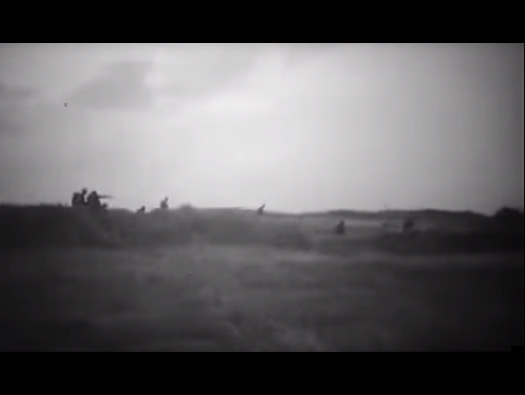 Infantry using a 5cm mortar in the field. Entrance into the crew room. Plan of an Ic116 Tobruk. Lc116 Tobruk for a 5cm le.Gr.W.203(f). The plate was to sit the 5cm mortar on. A box of mortar bombs. This is how it looks now after the thieves had been around. Out on the wire defending the rear defence. US attack north along the beach.. The left overs of the landing staging that floated on the tides. 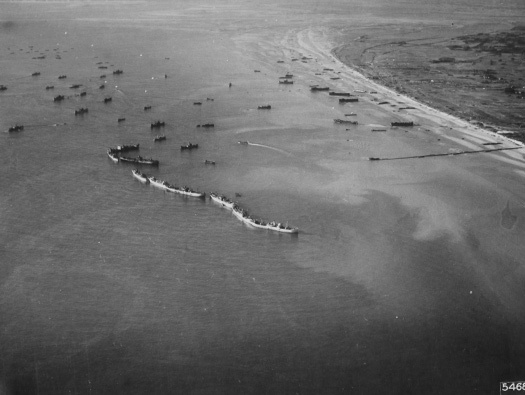 LCT could come it to the end and unload and smaller LCT's and infantry craft could land along the sides. 2e loading on LST's in England. Diagram of a concrete 'Beetle'. Floating roadway using 'Beetle' floats. 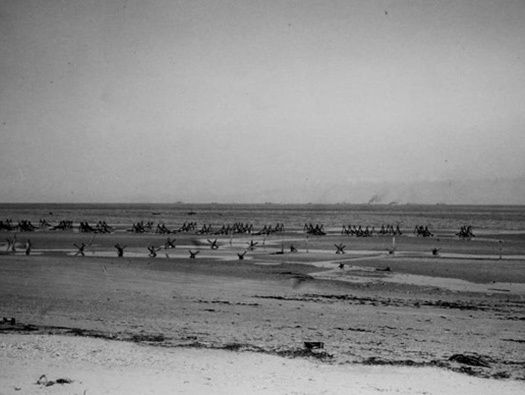 (Arromanches-les-Bains museum). The roadway off the beach. This is a picture that we rarely see or understand. 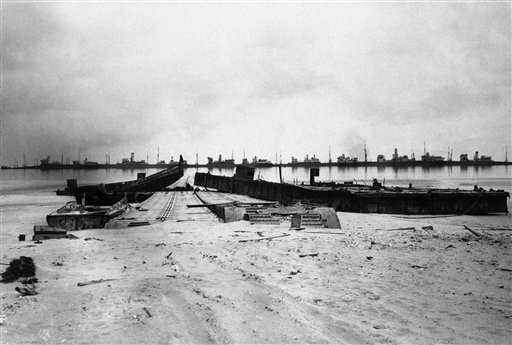 On the beach is the landing stage built to the south of StP10. The roadway inland and north & south. Then an odd parking area inland. This is where vehicles coming off landing ships/craft and driving into the fields to either remove all their water proofing and later to unload ammunition, food, spares, kit, etc. It would be then collected and taken inland to where it was needed.